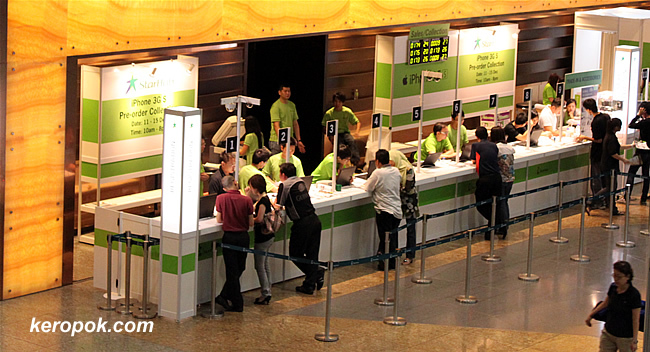 'Boring' Singapore City Photo: Oh.. No queue for iphone at the "Green Camp"
Earlier this evening, I went to get my Apple iPhone. Guess what? There's no queue! I waited till now to get the iPhone because I had an existing contract with Starhub and I could not switch telcos without paying a hefty penalty. Since I had waited so long, I did not get it on 9 Dec that it was launched, 2 more days would not have made any difference right? But it was worth the two extra days. I work in a company that has CIS (Corporate Individual Scheme) with all 3 telcos here. I emailed Starhub's rep that handles the accounts for our company. The rep said there's a corporate rate it gives me 20% off if I take the lower end plan or 30% off if I took the dearer plan. I could place an order and she can arrange for me to collect it at Suntec Convention Centre. I thought for a while, and decided, why not? (Hmmm, the whole place is so green!) 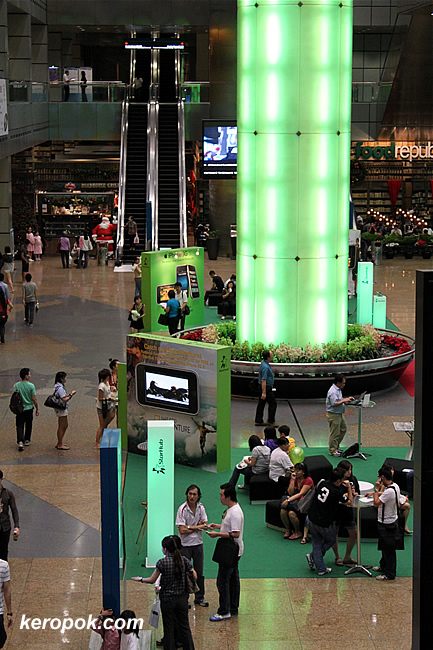 I wonder if Starhub chose this place, because the colour here matches their corporate colour! - I was 21 months into my 24 month contract so there's no penalty for early renewal. - No long queues with impatient people around. - 20% off for my monthly phone bill. - What made it even sweeter was that the guy whom processed my order said, as a corporate customer, I can choose 12 months of free caller ID and international roaming or 24 months of free caller ID without roaming. I took the 24 months free caller ID. (that's a savings of $126). - $200 off after I traded in my old phone. - free cover (green cover! I think they give green stuff on purpose!) and screen protector.